28639 PER924.jpg 500X638\PER924.jpg 38388 PER924_1.jpg 500X638\PER924_1.jpg Send A Hint! Product Description: less text Show your other half that he or she completes you with a personalised candy jar! 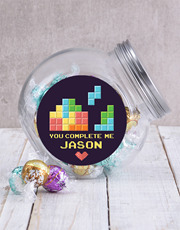 A clear candy jar is branded with a unique 'Your complete me' label design, which is personalised with the name of the lucky recipient. Inside the jar is a selection of yummy Coconut Lindt Truffles (10), Almond Lindt Truffles (10), and White Lindt Truffles (10). Make your loved one smile with this great gift! 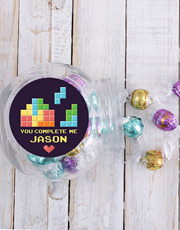 Get this Personalised You Complete Me Candy Jar delivered with NetFlorist.